Well, here we are, after about 18 months of being in process, the cabinets are done! Here is what they looked like when we purchased the home. And for those of you who know me well, you know I have this quirk about WHITE kitchen cabinets. 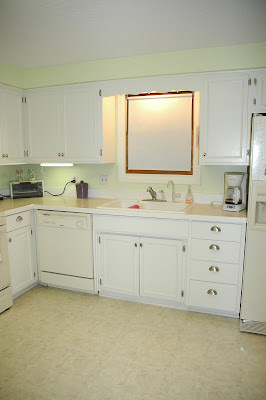 I know that its just all stuff and doesn't matter much in the whole realm of eternity... but I do love white cabinets. They are so fresh and cheerful. And you spend much of your day in the kitchen... or at least I do. So while I'm there I'd like to foster that cheerfulness as much as possible:) The first stage was to say goodbye to the stars, stripes and flags and I painted the walls a beige just to calm things down a bit. Then I could not take any more "zebras" as I lovingly called my cabinets, so off came the doors. My mom had seen a HGTV episode where they took plain flat door cabinets and added trim to dress them up. We decided to try it and after some initial debates about how to go about the project (you've got an engineer and and artist trying to come up with a plan:)) we got the trim on, primed and painted them... you guessed it - a lovely shade of white. Actually they are really more creamy to coordinate with the almond colored oven and fridge. The only thing left is a kitchen curtain I am working on, which hopefully will not take 18 more months to complete. The walls are a soft, but cheery green and I will accent with my current favorite colors of pink, green and blue. So, here's to show you can remake your kitchen on a dime. A couple of gallons of paint and some new hardware... cheerful, happy kitchen here we come! PS - A special thanks to my hubby for taking a whole day off of work just to cut and nail on all the trim... what would I do without you? Look at what I found in my sink! This is the cutest "dirty dish" I've ever washed in my sink... My niece Clara and my sister came for a visit a week ago. Since my baby tub was way up in the attic, the kitchen sink was the next best thing! Isn't she a honey? I love to wash dishes! Anyways, back to washing.... Now, don't get me wrong, there are plenty of times that every dish in the house is dirty and my family is looking at me wondering what to eat off of, but no matter the occasion, once I get started all is well with life. If you are mad it is a good way to work off the steam. It gives you time to think as you soak your hands in warm sudsy water. If you are sad you can stand there and cry and the tears fall nicely into the sink, not making any additional mess. Now you must know, there are a few rules and regulations as goes with the washing. I love washing the plates first. Then bowls and cups. Cups must be turned over upside down for a few minutes, then turned right side up to dry fully. A few items that I don't particularly enjoy washing are the silverware and plastic containers from work lunches. I don't know why, but I always avoid these guys until the very end. Sometimes the silverware soaks for a day before I will submit and wash them. And then once they are all done it's time to scrub out the sink. I love to use Soft Scrub with bleach in it to make it nice and white. And Barkeepers Friend to get out all the scratches from metal pans. Is there another lovelier sight than that sparkly white sink? Ok, my children are pretty darn cute, but the sink comes close. For a moment world peace has been achieved until someone walks by and puts their dirty coffee mug in my sink. Thank you Lord for another dish to wash! And on a last note, please, please, please do not ask me to dry the dishes. This, I cannot stand. Why? I don't know, maybe I didn't get to practice that one enough, or maybe it's that there is no window to look out when I dry. Drying is one of those miracles meant to be accomplished by the Lord himself. Thank you Lord for being such a great dryer! And now that you are convinced of my complete insanity, I say adieu. Happy Washing! As most of you know, I love to paint. I love to see how I can transform a room with a new color... 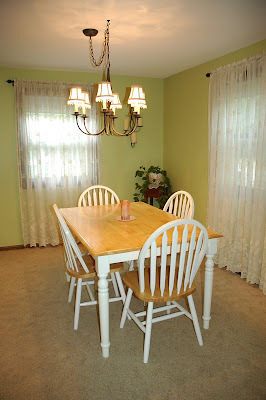 Here's a peek at what our dining room looked like when we purchased the home two years ago. Do you notice the lovely spider web design that the chandelier casted on the ceiling?Yep, that was the first thing to go. For awhile I had the walls beige, just to calm down the situation so I could think straight, but then I decided on a happy green to bring some cheerfulness to the room. Here's the final product. We found the new chandelier from Home Depot on line, (very reasonable price!). Since there is no office in the house, this room has to function as office/dining room. We found the storage cabinet on the left of the room at Home Decorators, which is an offshoot from Home Depot. It stores all of our computer stuff and office stuff. And when I'm not taking pictures of the room, I keep a bin on it for bills and other papers that need to be dealt with on a regular basis. OK, in actuality it is usually covered with papers, but that's life, right? One more small project I hope to get to some day is to make a fabric cover for the file cabinet so that you don't know it is a file cabinet. What do you think about these interesting rectangles? We could not quite figure them out so we had to paint them away... Our dining room is off of the kitchen and also goes into the living room. And if you are wondering what the white thing is that is hanging above the storage furniture, it is a piece of tin ceiling tile that used to be in old buildings. I found it at my favorite store, the Painted Porch and thought about it for about a month before I went back to get it. Ted thinks I am a bit crazy, but I love it and it was way cheaper than buying a new piece of framed artwork for the wall! We put our kitchen table here for now, but I am dreaming of getting an antique white table that is expandable to seat up to 10 for holidays when family comes to visit. You all can drop Ted a hint when you see him and remind him my birthday is just around the corner. But for now I am very happy and content with my transformation!